When I quit my job (six years ago) and moved home to Tennessee, it was with the plan that I would spend a few months with friends in Mexico. That plan went quickly from spending a few months to actually getting a job in Chiapas–but still with the plan to return to the United States in July of 2012. You know that trite saying that if you want God to laugh you should tell him your plans? My six months in Mexico has turned into (nearly) six years in Mexico. My sabbatical-of-sorts has given me an amazing husband who serves the Lord and two little girls who keep the laughter and love bubbling in our home. My trip-turned-life has allowed me to grow in my professional life as well, although that is perhaps the less important of these three gifts. Somewhere along the way, Mexico stopped being funny writing material, and just became normal. Now it’s the United States and their customs, way of thinking, and lifestyle that seem so foreign to me!!! The people in the United States live to work and the people in Mexico work to live. The people in the United States fill up their time with screens and activities that keep them away from their families–and even when they are with their families, the screen is a buffer of distraction. The people in Mexico have family at the core, and everything else is secondary. Our life in Mexico is peaceful, which is ironic considering my state is on a restricted travel list for government employees. Our days are spent with my girls playing with their babies, the rooster crowing at all times of day, and the smell of something yummy wafting through the house. During the week we buzz to school and daycare, but the evenings are our time–and we aren’t too tired to enjoy them! And so I find myself coming to this place again to write with a different lens: Yes, life in Mexico is just life, but it is coming to an end as our future unfolds before us. I am trying to stay positive, as I know that God has good things planned for us. (And how fitting that the same message that comforted me when I came here is comforting me as I prepare to leave here…) I know that there are opportunities in the United States that will be good for our family, and that God is taking us back in his time. I know that there will be ups and downs as we face the challenges of this year. I know that someday, we will look back on this time as if it were a minor series of events. When I booked the reservation at the hotel, something told me that my little girl would cut our visit short. I completely relaxed during that final day, and perhaps that is what coaxed my littlest love to arrive: a mommy’s body doesn’t cooperate well when it is in a stressful situation. My contractions began at around 11pm, and I just continued to read while relaxing in bed. They seemed pretty steady though, and I mentioned them to Victor about an hour later. He asked if I wanted to go home. I didn’t really see the need of abandoning our hotel room until we knew for sure this was it. I also wasn’t in a hurry: Ale took forever to be born, so I thought we had plenty of time ahead of us. Ale was asleep, so I just continued to monitor the situation without waking her. Finally, I decided I would use the app on my phone. It helped me to realize that maybe we were further along than expected. Around 2:30am we started the process of cleaning up and packing up the hotel. Ale awoke and couldn’t understand why we couldn’t go swimming. She had started the day wearing her swimsuit and tutu, and at this point was dancing around the hotel room wired. I had been telling her for a month that her sister was “coming soon,” so she was pretty unphased. That is until the contractions were strong enough for me to need to stop and breath. “Mama, stop! Stop doing that!” she said more than once. This was our last family photo before Josie was born. Victor was a little irritated that I wanted a photo during my labor–so there was no time for a retake! 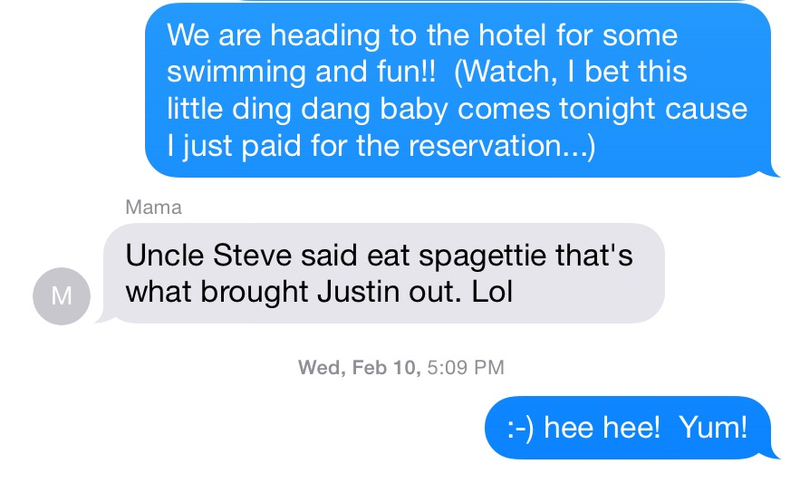 Victor called his mom to let her know I was in labor, and I called the midwife as we were leaving the hotel. 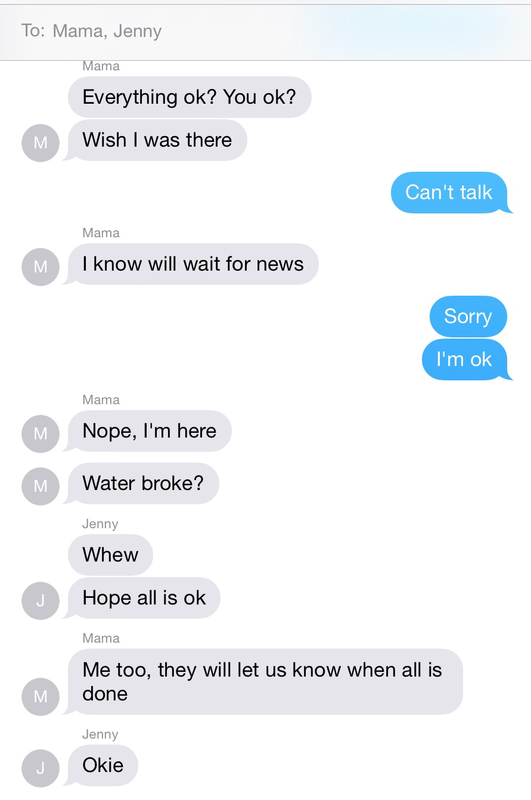 I also notified my mom and sister, as promised. Clearly it was the middle of the night, as both of them asked me if I was going to go home… Umm, no, I thought I would I would just use the bathtub here. This chat spans a couple of hours. I not-so-patiently checked out of the hotel. Contractions were pretty strong, and I had to stop to breath through them several times during the process. I would feel one beginning, and tell the middle-aged man behind the counter, “Excuse me.” Then I would turn my back on him, walk to the wall, hold on, and breath for a minute. When the contraction subsided, I walked back, smiled, and apologized. The taxi arrived and I joined my family outside. (My husband must have been a little nervous. He let my toddler pee in front of the hotel before getting in he taxi. No time for a bathroom break! No sir!) The ride home was pretty quick. I sat in the front seat just to continue making middle-aged Mexican men uncomfortable. We arrived home and began getting the room ready. Remember when I said I thought we had plenty of time? Well, we didn’t prepare the room before leaving for the hotel… So there we were, 3:30 in the morning getting everything in order. I went through the baby basket and cleaned off the table in our room. (By “cleaned off the table,” I actually mean I swept everything into a bag and stashed it in the closet.) I am pretty sure Victor swept and mopped. Finally, I took a permanent break from getting the room ready to concentrate on getting my body ready. My contractions were strong. I know this next part sounds crazy, so don’t judge me: As a contraction would start, I would imagine a tall skinny man. That’s what it felt like. The contraction was like a long line that went down my back. With my hands braced against the wall, I would start at his head and breath my way down his body. Weird, I know. It helped though, a coping mechanism of sorts. I also nodded my head as I breathed, so I am pretty sure I looked nuts too. The bathroom was nice because it was dark and private, but at this point it felt good to stand up. I didn’t want to bend over, lay against the sink/wall, squat on the toilet, etc. It felt good to stand straight pushing out to my sides with both hands against the doorframe. My midwife arrived and did a quick check on the baby. She, her crew, and Victor worked in the bedroom to get the pool set up and filled. I literally didn’t see my husband again until the baby was born. My labor was requiring all my concentration, and I didn’t have a break or all the time in the world to chit-chat like I did with Ale. Finally I asked if the tub was ready, and continued my labor there. I have sweet memories of Ale during this time. She would check on me during contractions. A couple times I remember her getting right down in my face and smiling a big, fake, slightly terrified looking smile. I was aware that she was there and needed some reassurance. I would smile back (I think, although it was probably more of a grimace. ), tell her I was fine, and let her know baby sister would be there soon. She joined me, bathing suit and all, in the birthing tub. My midwife showed her how to pour water on my back during the contractions. At some point, she got out and fell asleep in the next room. Later I found out that she refused to remove her bathing suit before sleeping. In the pool my contractions changed. They weren’t a tall, skinny man anymore. They morphed into a short, fat man. Instead of long pain, it was horizontal and stretched across my back. The short, fat man wasn’t nearly as nice as the tall guy. The coolest thing is that depending on my pain, my midwife knew where the baby was. She didn’t make me get out of the water to check the progress, because she could tell the labor was progressing. She also didn’t check to see that I was dilated, so I have no idea how far along I was. It seemed like I was in the birthing tub for hours. Later, Tirsa (the midwife) told me it was only about an hour. I laid down a while, like one might in a bathtub. Then Tirsa said it could help to change my position and move my hips. I would ask questions like, “Why is there no break?” “Why does it only hurt on one side?” She would just answer, and we would rest until the next contraction. She applied counter pressure to by lower back and hips during the contractions, as well as pouring the warm water over my back. I was on my knees while lying against the side of the tub. I remember somehow working my way from one side of the tub to the other. I didn’t voice these thoughts aloud, but in my head I thought, “Never again.” “I understand why women like drugs,” etc. When I started getting the urge to push it seemed unreal. With Ale I would push, then fall asleep in between contractions. With Josie, there was no time! I remember telling everyone I felt like I needed to poop. (A bit embarrassing now…) Tirsa said, “That’s because your baby is coming!” Someone got my errant husband, and he held me at the end. Three contractions back-to-back and Josie arrived! I was on my knees, so they helped her swim between my legs to the front. I laid back, and put her on my chest. Wow. That feeling. Even writing about it now makes me tingle inside. The hours after her birth were amazing too. I had watched this really inspiring video about the breast crawl, and I wanted to see if it worked. We moved to the bed and placed Josie on my chest. It was totally cool! Within 30 minutes she latched onto my breast. I delivered the placenta, but it was just placed into a bag alongside of us. I don’t remember when we cut the cord, but it was so calm in the room, it wasn’t a big deal! I moved to rest against the wall, and we continued to work on breastfeeding. I had (mistakenly) thought that after nursing Ale for 2 years and 4 months, I would be a pro. Wrong. Feeding a newborn is no task for the faint-hearted! I feel like I should reiterate how calm it was. Maybe I felt calmer because it was my second baby, but the general atmosphere of the room (and the people present) was peaceful with Josie. I had a home birth and water birth with Ale, but it wasn’t exactly the calmest environment. In fact, Josie’s entire labor was MUCH calmer. When it was over, I almost immediately felt like I could do it again. Abuela and Josie; My mother-in-law is something special. Upon meeting Josie, she THANKED me. It still makes tears come to my eyes to think about it! Los Abuelos! Having them here for Josie’s birth was really special. * “Ding Dang Baby” is from a Jacqueline Woodson book, Pecan Pie Baby. I read the book when I was pregnant, and I sat and cried in my office. It is all about a sister who isn’t overly excited about the birth of her sibling. She calls him a “Ding Dang Baby.” I was really worried about Ale being hurt or feeling replaced by Josie. After reading the book to my mom, we often referred to Josie as the “Ding Dang Baby.” This is an AMAZING book, by the way. 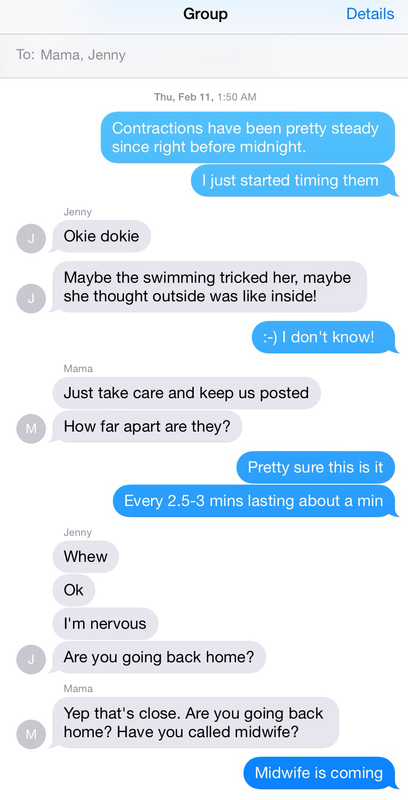 ** I am SO happy I have these text messages with Mama and Jenny. Not only do they remind me of details, but they provide quite a bit of comic relief! So at this point, I was 41 weeks and 4 days. I had reached the government doctor’s deadline. I had accepted a potentially dangerous intervention, thankfully without results. Now I was just waiting. I am lucky that my support system was as amazing as they were! Between my suegra, my husband, and my midwife, I was good to go! On Monday we decided we would continue to wait. We wouldn’t return to the government hospital, as I had been instructed. And I was okay with that! After all, my body knew what was right, and I had confidence in it. I had a message from my private doctor asking how things were, and I responded with a quick, “All is well! The pill didn’t work, so I am just waiting!” I didn’t want to tell her too much. She is wonderful, but I felt a bit awkward because I wasn’t having her at the birth. She was my back-up plan incase things didn’t go as well as expected at home, and additionally had been the attendant at Ale’s birth. I didn’t want us to end our relationship with poor terms–I wanted to keep things positive with her. Then everything changed on Tuesday. That evening I received a message from my same private doctor telling me that she was worried. “We have to induce labor by Thursday in a hospital with fetal monitoring or a c-section by Friday. I’m worried.” My heart dropped into my stomach. I cried alone for a while, and then began literally walking the floors. Maybe I could convince my body to send me a baby. Finally I woke Victor up, and explained, through tears, the message I had received. He was comforting, and reassured me that the baby wasn’t ready. When she was ready, then she would make her appearance. We decided to go for a walk (at around 2 a.m.) in the neighborhood, and we woke up his mom to let her know that she might need to listen for Ale. Then we took off. On this walk we came to the conclusion that we needed to just calm down. We made a plan to ignore the doctor’s message, and take a little staycation at a local hotel. The doctor had encouraged me to go to a temazcal, and this hotel has a sauna in the pool area. We came back to the house, and I sent messages to my midwife and my family to let them know they wouldn’t be able to reach me on Wednesday. I was going to shut out the world, relax, and enjoy my last days with Ale as an only child. We would try to ignore the doctor, but would keep in contact with the midwife. The next morning, I felt a billion times better. I received a message from the midwife assuring (AGAIN) that all was well with the baby. She wasn’t too big. I was healthy. She was healthy. We could wait before trying some interventions to induce her birth. We were going to focus that message, and forget about everything else. We reserved a room at the hotel, packed up Ale, and drove about 2 miles away to relax. Ale and Daddy at the hotel. 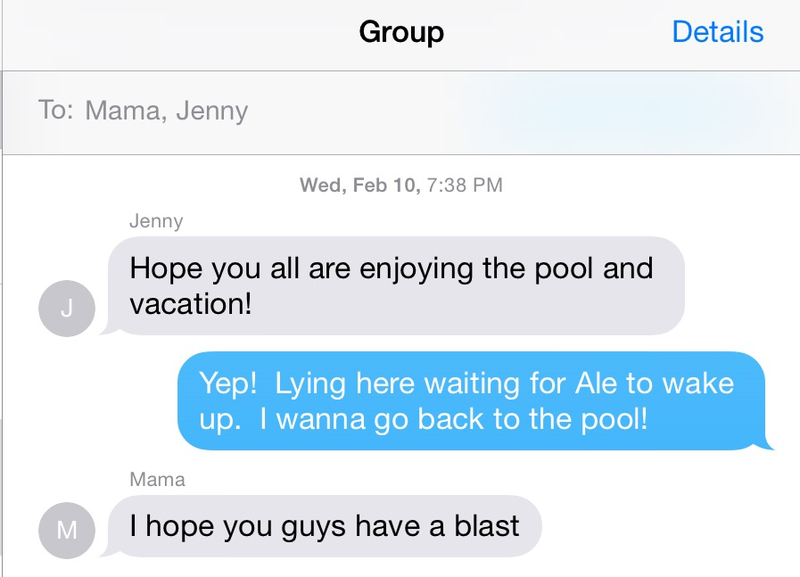 We had a great time hanging out at the pool–and remembering our visit there for my birthday before Ale was born. I got in the hot tub that I had avoided the previous trip, went to the sauna twice to relax, and played with my family in the water. Ale loves on Mami and Baby Sis. Mami is 41 weeks, 6 days pregnant. It was amazing. I even had some contractions that came and went–just like all the other times. We went out to grab pizza, snacks, and a giant bottle of water to keep us going until check-out the next day. I took a bath in the first bathtub I’ve been in since summer. Ale fell asleep watching cartoons, Victor began watching the news, and I read a novel on my iPad. It was late, but we were enjoying our stress-free family staycation. To begin the story of Josie’s birth, I should fill you in on the weeks prior to her birth. We knew we wanted to deliver at home again, but we wanted to look into just renting a pool on our own and using our doctor. After I posted a question online, we met with a doula at a place called Nacer Libre (Free Birth). Silka, the doula, asked if I might be interested in a midwife. Upon meeting Tirsa, the midwife, we were sold. There would be no need for the doctor–we wanted to have a peaceful waterbirth at home, assisted by a midwife. My due date was January 28th. My in-laws were here. My friend was here. The baby was not sure she wanted to be here. The private doctor I see (who delivered Ale at home) had been told that I planned a homebirth with a midwife, but I continued with my visits to her. I was told that the baby would probably come around the full moon, but the full moon came and went with no baby. All was fine in my visits–baby and I were healthy and just waiting for the big day. I was 41 weeks on a Thursday, and I had to go to the government hospital to extend my maternity leave. They had begun my maternity leave a week late, so that is the only reason I had the paperwork and payment for that long. (In Mexico women receive six weeks before the birth and six weeks after the birth.) If the baby isn’t born by the due date, they will give you a one week extension, taking you to 41 weeks. At that point, they induce or schedule a c-section. The coordinator informed me that I would only have until Monday to delivery the baby. Then they would need to schedule something, because I couldn’t extend my leave past one that day. The IMSS doctor did a normal check (blood pressure, listening to the baby, etc. ), then told me that I needed to go downstairs for an ultrasound. This was strange, but she insisted because I was at 41 weeks. Things began to feel ominous when, instead of pointing me in the direction, a secretary walked me down. On the way, she said I needed to call my husband and have him come meet me. This was really weird. Why did he need to be there for an ultrasound? We tried, but he didn’t answer. Finally we arrived, but I was confused. “Why were we in a different place,” I asked, “and not at the regular ultrasound room?” The secretary informed me that I needed to see the doctor in the Tococirugia. (I had no idea what that word was, but there was a symbol of a pregnant woman. I did know the word cirugia (surgery), and that made me more nervous. When I told the receptionists that I was going to go home, they said I couldn’t. Because, after all, I was forty-one weeks pregnant. I sat in a dirty little waiting room for about 15 minutes listening to the sound of some poor girl screaming bloody murder in the hallway in front of me. I waited. I speculated. And I decided I needed to get out of there. On the wall there was a sign that said if you wanted to leave against the doctor’s wishes, you had to sign something accepting responsibility. That sounded pretty good to me, so I asked the receptionist to sign so that I could go home. This was a different girl, and she began to tell me that I could leave–I had not been to see the doctor, so I didn’t need to sign anything. At that point, her partner began to text on her phone saying, “Espérame, espérame. Es que tiene cuarenta y uña semanas…” (Wait for me. 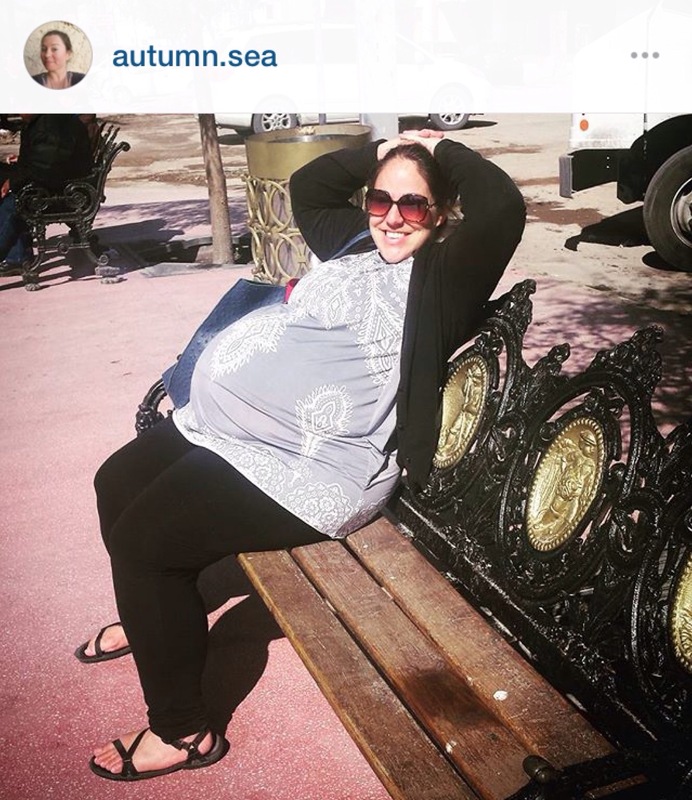 She is 41 weeks pregnant… ) I wasn’t going to wait around to see what they wanted. “Okay, bye!” I said quickly, and ran out the door. My thoughts are full of my baby girl who will join us in 8 short weeks… She wakes me up in the night, and I lie awake thinking of what I need to do, questions I need to ask, and money I need to save. My big girl is sleeping beside me, her feet occasionally digging into my sides. While she’s excited about her sister, I lie here wondering what she will do when another baby joins our bed. How will we sleep? Where will the baby go? How can I make sure Ale still gets to snuggle too? How will I breastfeed and read at the same time? Googling prepping my down-there region reminds me to look at hypnobirthing again. Quickly I open my iTunes and start listening to a variety of options. I find that I prefer a British or Austrailian accent over an American. When should I start meditating? How do I choose the right track for the right time? Is this just a study course, or will someone talk me through my birth? Will it make me fall asleep? Will I be wasting money? Oh! Money! I have to budget for the next two weeks before we get paid again. That reminds me to look into what essential oils will relax me or help stimulate contractions. While navigating the Young Living page, I get frustrated over the lack of prices. Is it worth it? Do I need to get a diffuser? Should I just bite the bullet and sign up for a starting kit? Did my friend already order one as we discussed today on the bus? Will I get it in time? What else do I need for her? I ordered some clothes and socks. What did Ale wear? Will her cloth diapers be too big? I begin to think of my cloth diapers folded neatly in the closet, and then of the new diapers I ordered. That reminds me that I need to get gift cards for my baby supply mules who went home over Thanskgiving break. Then my stomach growls. Really? I’m hungry in the middle of the night? While I’ve only gained three pounds, I start thinking of the next eight weeks of baby growth. She already feels so tight–how much bigger will I get? How long will the doctor let me work. I need to remember to print a copy of the “new” law to take with me to my appointment on Friday. What if he doesn’t let me work during January? What if the baby comes early? Will I be able to get a passport in time? Without a moment to spare (haha), I just have to check the requirements for Mexican passports. There is no way the baby could get her birth certificate and passport (from the U.S.) in time to travel in March. Oh! March! Graduation! Eek! Class work that is due soon! This, my friends, is why I am lying in bed awake at 3:05 a.m.
I’ve been thinking about these Mommy Wars that you hear about. (Without social media, would they exist?) Basically, this refers to moms judging one another for what they feed their kids, whether or not they immunize their kids, if they use cloth or regular diapers, if their boys are circumsized or not… The list goes on. 1). Does your kid wear shoes or go barefoot? 2). Do you cover your babies up sufficiently–even in 100 degree weather? 3). Does your kid bath, swim, or play in cool water? 4). Do you give your kids cold drinks or ice cream? 5). Do you coddle your kids enough or do you expect some independence? If Juan Venada (John Doe) saw me carrying Ale without a blanket covering her mouth, he would feel the need to tell me what to do. Once a lady stopped her car on the street to give us her sweatshirt for the baby. Basically, if you are living and breathing, that gives you the right to tell people your opinion about raising children in Mexico. Mommy Wars? I don’t think so… These are Pueblo Wars. So, he did the research. He got the doctor’s signature/letter of health. He printed what we needed. He paid for the passport. Crap! Was that a baby? If I feel a baby then I’m four months pregnant at least! Sooo, am I like those women on TV who don’t know they’re pregnant? I can’t be pregnant. Can I? Aww. I wouldn’t mind having another baby. Wait! What are you thinking! You don’t need another baby right now! What would I do if I’m pregnant? My boss is going to kill me.